Stadium Export Services can provide bespoke packaging and preservation solutions for all types of products, weights, dimensions and fragility. We have a wide range of experience when it comes to packaging goods for export. 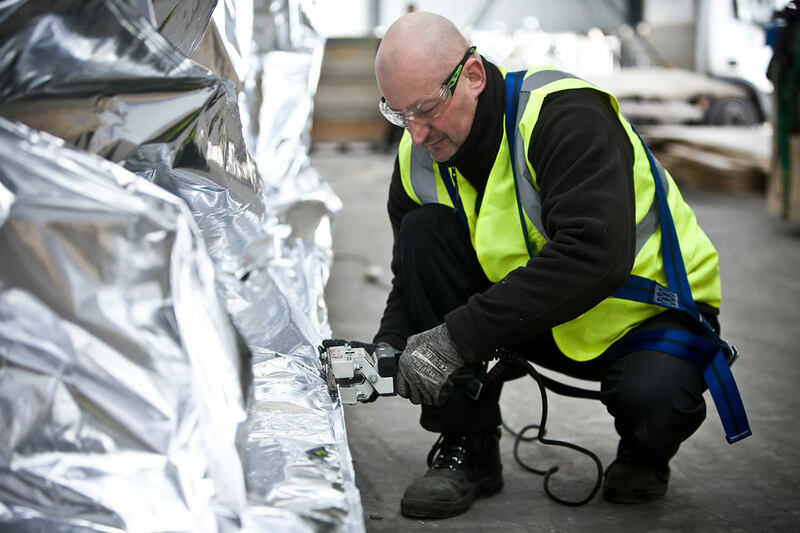 We can provide a team of expert offsite packers to your location or transport your items to our 65,000 square foot manufacturing facility. The following points need to be considered prior to packaging and preserving goods for export. Our team will take care of this for you. Are there any vulnerable or fragile areas that require specific attention? Please find below some of the most frequently asked questions around our Packaging and Preservation service. What are the most common types of preservation used when exporting goods? Usually oil based rust preventatives for bright metal surfaces, VCI materials (volatile corrosion inhibitors), climatic barriers and desiccants. Volatile corrosion inhibitors are materials (films, papers and foams) that emit chemical molecules attaching themselves to metal surfaces. A layer only a few molecules thick is sufficient to prevent corrosion forming. VCI provides a dry means of protection other than oils and greases and is a low cost solution compared to other alternatives. What would you require if we needed you to pack at our premises? An adequate packing area should be safe and unrestricted with any other site activities being kept clear of the packing area. Suitable lifting and handling equipment should be available where necessary including working at height access. Operatives may need compressed air (for pneumatic nail guns) and an electricity supply for sealing foil bags or hand tools – battery operated equipment may be used as an alternative. What methods are used to secure items within the packaging? There are numerous materials and methods to suit each application for example, stretch wraps, polyester strapping, timber block bracing, steel clamps and brackets. It is also important to protect the goods’ surfaces when being secured. Typical materials include: bubble wrap, corrugated paper, felt and foam. Can I determine the external dimensions of a case prior to packing? What information can be provided upon completion of the packing? Stadium Export Services will provide gross weights and dimensions. We can also send photographs throughout the preservation and packing process upon request. Can you pack or unload shipping containers? We unload and pack 20ft and 40ft containers on a daily basis. All flat rack containers are secured in accordance with the current Hapag-Lloyd specification. Stadium Export Services has worked with J.H.S on recent projects involving operating in clean room environments often out of normal working hours to decommission, protect and ship high value machinery to various sites throughout Europe. Stadium undertook the packing and shipping of the cargo ensuring safe delivery to the receiving sites. In total, over 200 tons of pharmaceutical machinery was uplifted, preserved, packed and shipped by Stadium Export Services arriving on specific dates to ensure the receiving sites had the arrangements in place to unload the cargo. I have been involved in the pharmaceutical and food industries for over 20 years, managing numerous installations and machine moves throughout the world. Not only is the standard of preservation and packing of this production machinery vitally important, there are usually extremely challenging deadlines to achieve to ensure site disruption is minimised. Stadium has an excellent track record in terms of reliability, quality and flexibility and are the first choice for JHS for all our packing and freight requirements.